Despite losing, the U.S. men's team advanced to the next round of the World Cup, thanks to Portugal's goal differential. 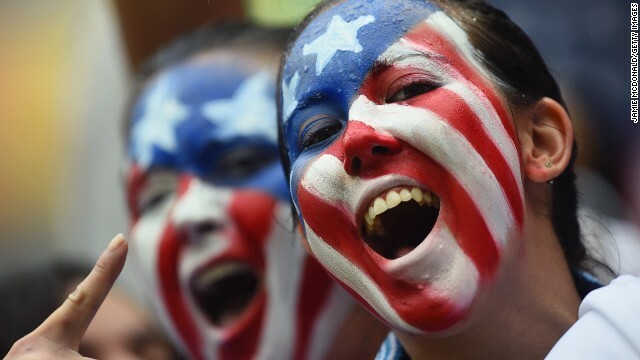 U.S. soccer team gets a little help from Portugal in the World Cup. Benghazi suspect's slow ship ride nears end. And the Ebola outbreak hits unprecedented levels. Startling developments: Georgia authorities investigating the death of a toddler left in a sweltering SUV seized computers from the office of the boy's father. What they found was startling: an Internet search for "how long does it take for an animal to die in a hot car," a source says. It's unclear when the Internet search was conducted and whether the father, Justin Ross Harris, did the searching. U.S. sneaks into knockout round: The U.S. men's national soccer team can breathe easy - for now. Despite losing the game yesterday, the team advanced to the round of 16, thanks to a little help from Portugal's goal differential. Next up for the U.S.: Belgium on Tuesday. President's appointment powers: The Supreme Court sided with Congress yesterday in a high-stakes power struggle over presidential recess appointments, in which officials get top government jobs temporarily without Senate approval. The justices' unanimous ruling could invalidate hundreds of decisions by a federal agency. The Ebola virus has hit unprecedented levels in West Africa, and the World Health Organization says drastic action is needed. The WHO has sent teams of experts to help locals deal with the epidemic and plans to meet next week to discuss ways to contain it. The suspected mastermind of the deadly 2012 attack on the U.S. mission in Libya arrives on American soil as soon as this weekend, a law enforcement source says. Ahmed Abu Khatallah was arrested by U.S. commandos this month. He's spent most of the past two weeks aboard the USS New York being interrogated by FBI and CIA agents as they make their way back to the United States. Doggie acrobat: Jiff the Pomeranian does a walking handstand. Cute lil' dude with an impeccable taste in party music! Hello, kitty, kitty! : Two felines meet for the first time. Awwwwwkward! Babies do the cutest things: Leon discovers he can move his eyebrows. And the world lets out a collective chuckle. What a nice ending to this week. Baby Leon discovering the art of raising his eyebrows. Jiff the Pomeranian's unique talent. And the two cats meeting for the first time. Was that a real cat that came up the side of the chair? It looked like a puppet. LOL!!!!!!!! Happy weekend to you from all of us at #NewDay!